Goodyear Spa Manager, Massage Therapy Director, Licensed Massage Therapist. 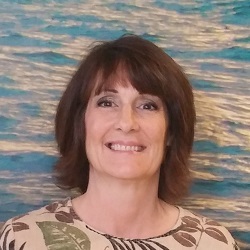 Aloha: Jodi is senior manager at Hawaiian Experience Spa. In addition to her main role as Goodyear spa manager, Jodi is also Massage Therapy Director for all of our spas. Jodi conducts and supervises our training programs for massage therapists and ensures are expert level of massage therapy is maintained through out the spas as we grow. My name is Jodi and I am a licensed massage therapist. I graduated with honors from The Bryman School of Arizona in late 2010, received my license in early 2011 and have been working full time as a therapist since. I have been trained in a variety of modalities but I specialize in using deep tissue techniques to treat chronic pain and tension in the neck and shoulders as well as the low back, including sciatic issues. I believe that chronic pain, even at low levels, makes us feel tired and older than our years and my greatest professional satisfaction comes from helping clients improve their quality of life by reducing their pain levels. I am excited to be a part of the Hawaiian Experience Spa team and I look forward to sharing the spirit of Aloha with you. As manager of the Goodyear day spa my goal is to make each of our clients feels like part of the ‘ohana (family) and make every visit feel like a little piece of paradise.